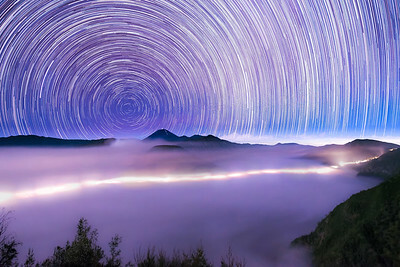 Time Trails shows the passing of time and light of the night sky. 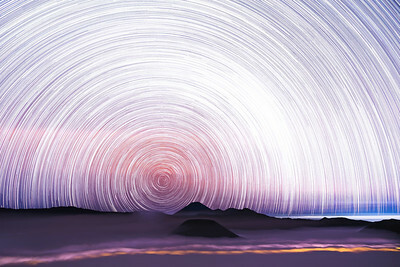 By overlaying all images of a time lapse, all the light remains, resulting in light trails. 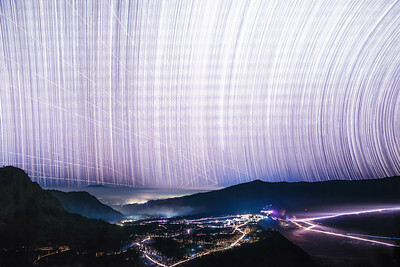 Although similar to a very long exposure, these images can show the time and light that occurs over many hours, up to a full night. 30 images, 30 second interval, 15 minutes. 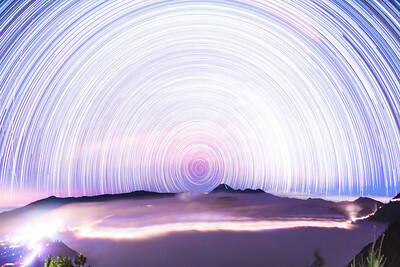 Shot at Mt Bromo, Java, Indonesia. Image from my Time Trails serie, part of my TimeScapes theme. 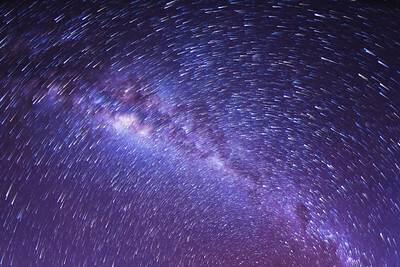 In TimeScapes I display the passing of time by using certain or all images from a time lapse recording, combining these images using different techniques. In Time Trails I capture time by overlaying images to movement of the stars in a certain time period. 100 images, 30 second interval, 50 minutes. Shot at Mt Bromo, Java, Indonesia. Image from my Time Trails serie, part of my TimeScapes theme. In TimeScapes I display the passing of time by using certain or all images from a time lapse recording, combining these images using different techniques. In Time Trails I capture time by overlaying images to movement of the stars in a certain time period. 23 images, 30 second interval, 11,5 minutes. 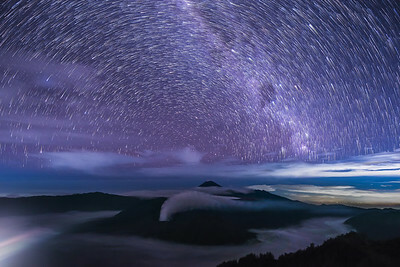 Shot at Mt Bromo, Java, Indonesia. Image from my Time Trails serie, part of my TimeScapes theme. In TimeScapes I display the passing of time by using certain or all images from a time lapse recording, combining these images using different techniques. In Time Trails I capture time by overlaying images to movement of the stars in a certain time period. 102 images, 30 second interval, 51 minutes. 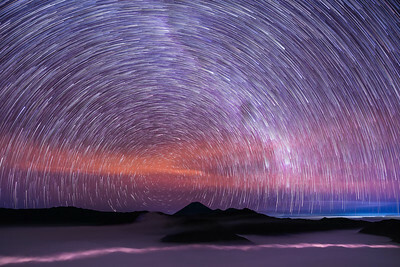 Shot at Mt Bromo, Java, Indonesia. Image from my Time Trails serie, part of my TimeScapes theme. 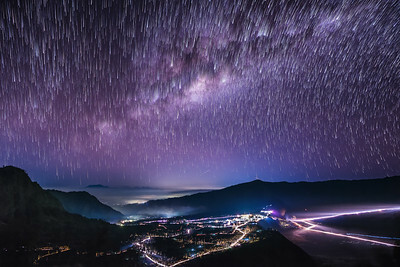 In TimeScapes I display the passing of time by using certain or all images from a time lapse recording, combining these images using different techniques. In Time Trails I capture time by overlaying images to movement of the stars in a certain time period. 60 images, 30 second interval, 30 minutes. 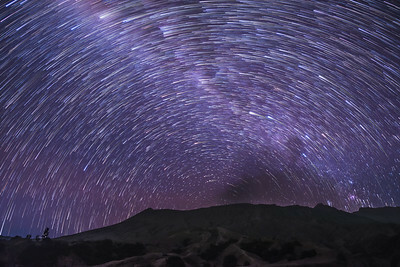 Shot at Mt Bromo, Java, Indonesia. Image from my Time Trails serie, part of my TimeScapes theme. In TimeScapes I display the passing of time by using certain or all images from a time lapse recording, combining these images using different techniques. 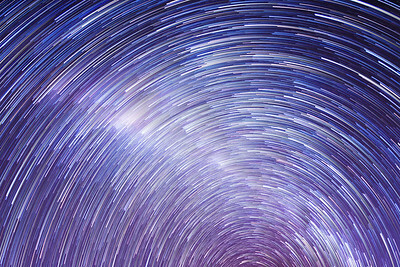 In Time Trails I capture time by overlaying images to movement of the stars in a certain time period. 130 images, 30 second interval, 65 minutes. Shot at Mt Bromo, Java, Indonesia. Image from my Time Trails serie, part of my TimeScapes theme. In TimeScapes I display the passing of time by using certain or all images from a time lapse recording, combining these images using different techniques. In Time Trails I capture time by overlaying images to movement of the stars in a certain time period. 20 images, 30 second interval, 10 minutes. 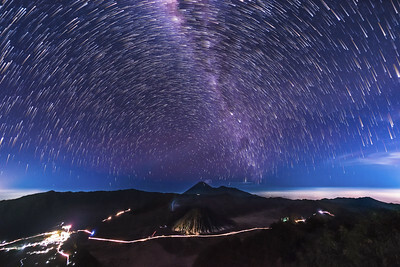 Shot at Mt Bromo, Java, Indonesia. Image from my Time Trails serie, part of my TimeScapes theme. In TimeScapes I display the passing of time by using certain or all images from a time lapse recording, combining these images using different techniques. In Time Trails I capture time by overlaying images to movement of the stars in a certain time period. 200 images, 30 second interval, 100 minutes. Shot at Mt Bromo, Java, Indonesia. Image from my Time Trails serie, part of my TimeScapes theme. In TimeScapes I display the passing of time by using certain or all images from a time lapse recording, combining these images using different techniques. In Time Trails I capture time by overlaying images to movement of the stars in a certain time period. 220 images, 30 second interval, 110 minutes. Shot at Mt Bromo, Java, Indonesia. Image from my Time Trails serie, part of my TimeScapes theme. In TimeScapes I display the passing of time by using certain or all images from a time lapse recording, combining these images using different techniques. In Time Trails I capture time by overlaying images to movement of the stars in a certain time period. 240 images, 30 second interval, 120 minutes. 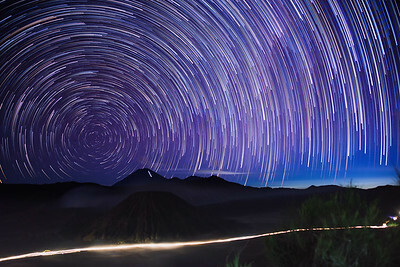 Shot at Mt Bromo, Java, Indonesia. Image from my Time Trails serie, part of my TimeScapes theme. In TimeScapes I display the passing of time by using certain or all images from a time lapse recording, combining these images using different techniques. In Time Trails I capture time by overlaying images to movement of the stars in a certain time period. 210 images, 30 second interval, 110 minutes. Shot at Mt Bromo, Java, Indonesia. Image from my Time Trails serie, part of my TimeScapes theme. In TimeScapes I display the passing of time by using certain or all images from a time lapse recording, combining these images using different techniques. In Time Trails I capture time by overlaying images to movement of the stars in a certain time period. 487 images, 30 second interval, 243,5 minutes. Shot at Mt Bromo, Java, Indonesia. Image from my Time Trails serie, part of my TimeScapes theme. In TimeScapes I display the passing of time by using certain or all images from a time lapse recording, combining these images using different techniques. In Time Trails I capture time by overlaying images to movement of the stars in a certain time period. 463 images, 30 second interval, 231,5 minutes. 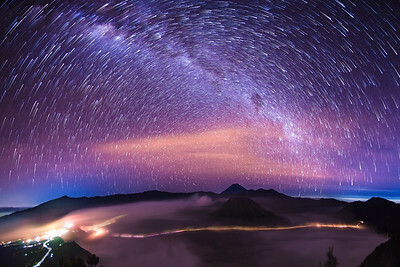 Shot at Mt Bromo, Java, Indonesia. Image from my Time Trails serie, part of my TimeScapes theme. In TimeScapes I display the passing of time by using certain or all images from a time lapse recording, combining these images using different techniques. In Time Trails I capture time by overlaying images to movement of the stars in a certain time period. 970 images, 30 second interval, 485 minutes. Shot at Mt Bromo, Java, Indonesia. Image from my Time Trails serie, part of my TimeScapes theme. In TimeScapes I display the passing of time by using certain or all images from a time lapse recording, combining these images using different techniques. In Time Trails I capture time by overlaying images to movement of the stars in a certain time period. 400 images, 30 second interval, 200 minutes. 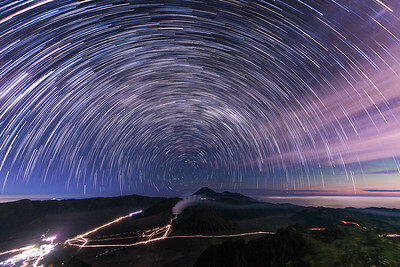 Shot at Mt Bromo, Java, Indonesia. Image from my Time Trails serie, part of my TimeScapes theme. 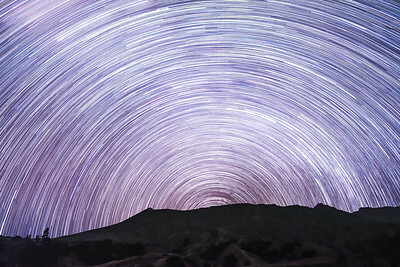 In TimeScapes I display the passing of time by using certain or all images from a time lapse recording, combining these images using different techniques. 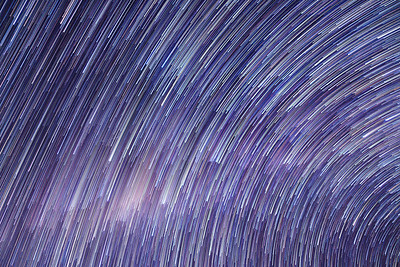 In Time Trails I capture time by overlaying images to movement of the stars in a certain time period.